Celebrating the 60th anniversary in the hospitality industry, the world’s largest hotel chain, Best Western International (BWI), officially announced its first hotel in Chiang Mai. Located in the modern emerging Chiang Mai Business Park, just a stones throw away from the Carrefour Shopping Center on the Chiang Mai – Lampang Highway, the sophisticated brand-new Khum Phaya Spa Resort offers 80 deluxe rooms, six pool villa suites, and one additional president villa suite. On July 7, 2006, the agreement was inked between BWI Vice President International Operations Asia Mr. Glen de Souza and Managing Director of Khum Phaya Spa Resort Wachara Tantranont. Some 50 invited guests and members of the press had the opportunity to inspect the mock up rooms and enjoy a dinner at the Plub Pla Restaurant within the Khum Khantoke complex. To highlight the position of Thailand as the “Spa Center” of the world, there will be the classic Asiatique Spa managed by Spa Care International from Singapore. Managing Director Peter Sng introduced its boutique concept with an impressive menu of treatments, such as massages, body scrubs, facials and nail services. Wachara Tantranont, President of V Group Building, envisions the establishment of a “Spa Academy” to put Chiang Mai on an international level, where 10 percent of students will come from needy families and therapists will be trained from all over the world. Lanna Thai-style Khum Phaya Spa Resort represents a Best Western Premier Hotel in Chiang Mai and will further add to the strength of BWI with 19 properties in Thailand by the end of 2007. BWI, with its headquarters in Phoenix, Arizona, is also operating Maya Koh Lanta Resort in Krabi and Bangtao Beach Resort & Spa in Phuket as Best Western Premier Hotels for the discerning traveler. For further information, please go to www.khumphaya resort.com. 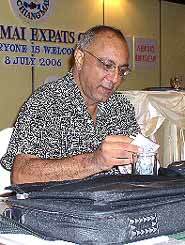 Initially, Boonlue Mongkhol objected to his village being used for a TV miniseries about the 2004 tsunami. He lost his loved ones in the disaster and didn’t want to relive the tragedy. But when the British Broadcasting Corp. advertised for extras, the 38-year-old businessman put aside his personal feelings and spent five days portraying a corpse and a body collector - earning 500 baht (US$13) a day. The filming of “Aftermath” - a two-part miniseries produced by the BBC and U.S. cable channel HBO, shot along Thailand’s tsunami-battered coast - has set off a debate over the merits of bringing the tragedy to the screen so soon after the disaster. Supporters say it’s an important story, touching on universal themes of hope and loss, while many survivors say reviving the tsunami has hit them with more heartache. Similar debates among survivors have played out in the United States with “United 93,” the first big-screen treatment of the Sept. 11, 2001, terrorist attacks, and in Australia when there was talk of making a movie about the 2002 Bali bombings, the victims of which were mainly Australians. “You are exacerbating the healing process,” said Anie Kalayjian, whose non-governmental Association for Trauma Outreach and Prevention has provided counseling to survivors of the tsunami and last year’s Pakistan earthquake. Billed as a compelling story of survival and courage, the two-part series to be shown on HBO and BBC Two later this year follows eight characters in the aftermath of the tsunami including a young couple searching for their child, an Englishwoman whose husband and son are missing, and a Thai man who lost his family and village. The drama is being directed by Bharat Nalluri and the cast includes Tim Roth, Sophie Okonedo and Toni Collette. Khao Lak, with its white-sand beaches and stunning views of the Andaman Sea, was chosen as the location because a majority of the 5,400 people killed in Thailand came from surrounding villages on the country’s southwestern coast, as did the thousands more left homeless. Though many of the hotels and hundreds of homes have been rebuilt, jobs remain scarce and many families are still grieving for dead relatives. Other Thais welcomed the production, saying it could bring jobs to the area and serve as an educational tool. Thai survivors and relief workers say they were most angered that the crew chose to re-enact the disaster - complete with dead bodies and overturned cars - on the main road through Khao Lak that was devastated by the giant waves. Others were upset the crew chose to put up flyers throughout the tsunami-hit region, saying victims were needed as extras. “It was pretty tasteless. People are not happy,” said Robert Reynolds, an American charity director whose Srithong Thukaoluan Foundation is supporting more than 100 children affected by the tsunami. Finola Dwyer, the drama’s producer, said she regretted the wording in the flyer. 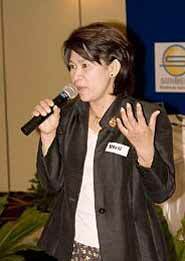 But she defended the decision to shoot in areas hit by the tsunami. “Why not? It did happen. It’s not a piece of fiction,” Dwyer said. Dwyer said she faced similar challenges shooting the acclaimed drama “The Hamburg Cell” which came out in 2004 and delves into lives of the Sept. 11 hijackers as it recounts the meticulous preparations for the attacks. In Thailand, Dwyer said they sought and received government approval before shooting started because of the nature of the project. But even as they shot around the resort town of Phuket and Khao Lak, she said they were embraced by locals and even some survivors came to watch. “When we were in Khao Lak, we had people come by and tell us their stories of how they were caught up in the tsunami,” Dwyer said. The Chiangmai Expats Club (CEC) held its regular meeting on Saturday, July 8, 2006, at 10:30 a.m., at the Chiangmai Orchid Hotel on Huay Kaew Road. Jim Cox, president and founding member was at the helm as he introduced several newly joined club members who gave short talks on their reasons for relocating to Chiangmai. The guest speaker, Mohezin (Mo) Tejani, introduced his new book, A Chameleon’s Tale: True Stories of a Global Refugee, and he also shared excerpts from this exciting, intriguing first volume of his memoirs is a reflection of his life of travel and the continued search for a home. Mo currently calls Chiang Mai “home”, and while residing here writes articles and feature stories for various magazines in the region. Mo shared many experiences gained as he globe-trotted across four continents, living and working his way from one “home” to another. He admits he is a life-long nomad, and at times has been forced to leave some countries, casting him in the role of a refugee due to dangerous living conditions brought on by unjustifiable military occupations and terroristic activities set forth by local governments and terrorists. Mo was born in Tanzania to Indian parents, and chooses to call Uganda his first home. He fled Uganda with 80,000 other people at the time military strong man Idie Amin was casting his terror upon Uganda’s people. This world traveler has hitchhiked all over North America, learning about “…his new life on the open road”. His two-year journey to Latin America gave him the opportunity to learn the Spanish language and to find another place to call home until army tanks occupied the Peruvian town in which he had chosen to live. His Latino sojourn over, he ventured to Southeast Asia and worked with the peoples of Lao, Khmer and Vietnam in the many refugee camps. This move eventually brought Mo to Thailand, the country he now calls home. A Chameleon’s Tale – True Stories of a Global Refugee is on now on sale at your favorite bookstore. If they don’t have it yet, put your name on their waiting list. CEC members had a surprised treat at the meeting’s end. Lateef Fahari, owner and chef at Hell’s Kitchen, Afro-American Style Bar-B-Q, and his staff brought samples of their delicious spare ribs and chicken barbeque, complemented with his special secret sauces and his “deep down South” mouth-watering cornbread. (Try to say all that with your mouth full.) You will easily find Hell’s Kitchen at 250/82 Leabklongchonlaprathan Rd. T. Banwan, A. Hang Dong, in Chiang Mai. Contact information: 04-732-7159 or 053-430-680. Email: [email protected] SmilingCobra.com. Look for a little devil when you arrive. All in all, there have been a lot of treats for Expats over the past weeks. The meeting held on 24 June brought with it the introduction of Andrew Bond, designer and builder of our new, informative CEC website (www. chiangmaiexpatsclub.com) Club members and others have all been eagerly awaiting the site’s debut. Andrew says the site has, among other features, a Delphi Forum, a message board and a posting site. Dr. Bennett Lerner, an eleven year staff member and lecturer at Payap University came along to tell us about the planned 26 August concert in which he will no doubt enthrall his audience with his magnificent piano talents. You won’t want to miss this concert. I attended his previous performance and was very impressed. Pol. Lt. Col. Roobkajorn from Chiang Mai’s Immigration Department updated member on current policies concerning visas, passports, housing purchases and other matters to ease one’s stay while living in Thailand. 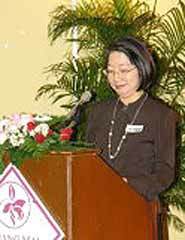 The keynote speaker was Dr. Carolina Thompson, who is a board member and treasurer of The Foundation for the Education of Rural Children and works with children of all ages in and around Chiang Mai. She encouraged CEC members to share a small portion of their time with children who are so much in need of caring, patient adults in their lives. A few personal qualities a volunteer might possess are initiative, patience and flexibility. Dr. Thompson pointed out that volunteers should have positive attitudes and above all, take the time to learn about and appreciate the Thai way of life. Good time management skills are also important for any volunteer, especially when working with children. She says when a volunteer tells a child that “they’ll be there” for the child, you can bet the child will expect that person to show up. If you have some time to share with appreciative children, please contact Dr.
Several foundations and organizations are ready to receive your help, no matter how small the amount of time, you may wish to share. The next CEC meeting will be held at the Orchid Hotel, 3rd floor, on Saturday, July 22, at 10:30 a.m. . . . Remember, it’s all about Expats helping Expats. Recently we reported the freak firestorm that destroyed the entire Karen student’s dormitory complex, Suan Phantakit (the Mission of Love), in Chom Thong District town at the end of May, and appealed for your assistance. It was not long before practical assistance arrived, in the form of emergency shelter “domes” originally designed, built in Ban Chang and erected in Phangnga Province in early 2005 to provide accommodation and classroom facilities for local children in the aftermath of the devastating tsunami of Boxing Day 2004. Jim Soutar, founder of the Pakanyor Foundation, contacted the Master, Mike Johnston, of Lodge Pattaya West Winds, which had been the motive force behind the funding and erection of nine such emergency shelter domes in Phuket and Phangnga, and explained the urgent requirement. Mike and his Committee immediately swung into action and secured the enthusiastic support of the Grand Lodge of Western Australia, the Rotary Club of Jomtien-Pattaya, the Sportsman Inn, the Jesters, the Pattaya Ladies Club and others who had contributed to the original emergency shelters for the relief of children adversely affected by the tsunami. Funds for transportation and refurbishment of the emergency “domes” at Ban Thap Lamu School in Phangnga, now no longer required as the newly-constructed school buildings are fully completed, were quickly allocated from a special budget provided by the Grand Lodge of Western Australia. The domes were disassembled by the staff of Sea and Oilfield Services (S.O.S.) of Chonburi and transported north to Chom Thong . On 12 June the domes were unloaded at the dormitory site and erection immediately commenced, under the guidance of Dave Doll of S.O.S. and Kevin Fisher, both members of Lodge Pattaya West Winds, and with the enthusiastic assistance of the local Karen people. By 23 June both domes were completed and formally handed over to Sister Saralee, the Karen Catholic Sister in charge of the dormitory project and in the presence of Khun Kohchit, Chairman of the local Tambon Administrative Organisation and himself also a Karen. One dome is a 21 metres long by 6 metres wide building with a dividing wall in the centre, which will provide sleeping accommodation for 40 boys as well as a study and recreational area. The second dome (14.7 metres by 6 metres) will provide accommodation for 20 girls and a separate room for the Karen Sisters who care for the students. Once the emergency domes in Chom Thong are no longer required, they will be disassembled and stored ready for use once again wherever disaster strikes. Earlier this month a serious road accident occurred on the Superhighway, resulting in one man being taken to McCormick Hospital with facial injuries. The injured man was a member of SOS Chiangmai, and he called the helpline to inform the SOS team of his plight. SOS acted as translators, arranged legal assistance, visited the member in hospital, and alerted his next-of-kin. Happily, the member has now made a full recovery and is back on the road, with all legal matters resolved, due in no small part to SOS‘s legal team, ICO. The reason lots of foreigners live in Chiang Mai is obvious - it’s simply a wonderful place. Living in a foreign country is both enjoyable and interesting, partly due to language and cultural differences. For the majority of us “sawadee krup” and “sabaidee mai?” are about as far is it goes when speaking Thai. This can be a lot of fun and get you by on a day-to-day basis, but what if something goes wrong? What if you were to be involved in a serious accident and “kor tort krup” (sorry) doesn’t quite cover it? What if you are detained by police or immigration officials and were unable to make yourself understood? We know of a case in Bangkok, for example, where an English man realized his visa had expired and approached the British consulate for advice. They duly told him to report to the nearest police station…where he was immediately locked up for three days, with nine Thai cellmates, until he could be seen by the appropriate officials. Although the Thai police generally do a great job, foreigners frequently do encounter difficulties, usually caused by simple misunderstandings. These situations can usually be resolved in a matter of minutes with the correct legal representation present. For these reasons we decided to set up an organization to help foreigners in situations such as these. SOS Chiang Mai provides 24-hour / 365 day emergency assistance. I f an SOS member is detained by police or immigration officials, SOS visit in person, and arrange legal assistance if necessary. 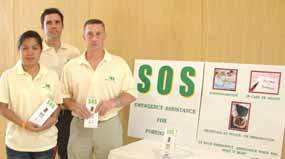 In the event of a member being hospitalized due to serious illness or injury, SOS also help with health insurance claims etc. In the event of a member’s death, SOS would assist with funeral arrangements and ensure the member’s Thai will was honored. We believe this service will not only benefit foreigners who are unfortunate enough to find themselves in such a situation, but will also assist the hard-working Chiang Mai authorities, who face a wide range of challenges during the course of their duties. For further details, please e-mail [email protected] or visit our website at www. soschiangmai.com. Hopefully, you’ll never need to contact us again – but you’ll always know we’re here if you need us.